Visit the official SHIATS website and click on the application form link. Fill in the application requirements duly and click on submit. Make the application fee payment online. The common SHIATS 2019 application form will be applicable to all academic programmes irrespective of Undergraduate, Postgraduate, B. Ed. B. P. Ed, M. Ed and Diploma for admission through Entrance Test or Direct Interview. The SHIATS admission form 2019 will be available from 21st January 2019 in both online (at the official website) and offline mode (at the SHUATS campus). The candidates have to fill the SHIAT 2019 application form before 20th May 2019. The candidates who want to apply online, the application form will be available on the university website i.e. www.shiats.com. The candidates should have to fill the application form which will include personal and education details. Submit the Online application form by clicking the "Submit" button, in case of the page does not show up properly fill the form again and submit. After submitting the form candidate will get the online application form with query number and query code. This is the confirmation that the candidate's application form has been successfully submitted. Once the form is filled online, the candidate must have to pay the application fee of INR 1,200/- for UG and PG programmes and INR 1,400/- for B. Ed. and M. Ed. programmes. Demand Draft: The candidate should have to make a Demand Draft in favour of The Registrar, SHUATS, Payable at Allahabad. Challan: for online challan process, the candidate should have to click on online fee, then have to enter the candidate's query no. and query code, select PNB or AXIS Bank Challan. Take the printout of the Challan and deposit the amount in the respective Bank. Online SBI Collect: for online SBI challan process, the candidate should have to open S.B.I. website and click on State Bank Collect, then select State of Corporate/ Institution: Uttar Pradesh, Select Type of Corporate/ Institution: Educational Institution and Click Go Select Educational Institution Name: SHIATS, Naini, Allahabad and finally, Click Submit. then select payment category: Online Application Form and Enter Query No, Name etc.. now Click Submit. Take a printout of successfully completed payment page with Reference No. 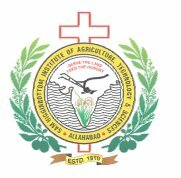 The application form can be obtained by sending a crossed bank draft for INR 450.00 (INR 400/- for Prospectus & Application Forms and INE 50 for postal charges) in favour of the Registrar, Sam Higginbottom University of Agriculture, Technology And Sciences, Allahabad by registered post. THE SHIATS authority does not accept Postal orders/ cheques or money orders. The prospectus and application forms will be available on cash payment of INR 400.00 (INR 400/- for Prospectus and Application Forms ) from the university fee counter on any working day from Monday to Friday between 09:00 a.m. to 05:00 p.m. Note: While paying the application fee if the candidate can't remember the Query Code, then he/she has to click on the "Forgot Query No/ Query Code" link. The candidate will redirect to one page where he/she has to enter DOB and email address and click on the "Submit" button. In the given email address candidate will get the Query Code. I forgot to write in my own handwriting about the agreeing terms and conditions of shuits?will it get rejected or can I inform the office about it!please help! You have to contact the authorized officials of the SHIATS. The Contact details are given below. i lost my application form of SHAITS entrance exam and i also don't have registration number. so, is there some chances to get admit card. if yes, then how? In case you lost the application form, and you don't remember the application number and password, you have to contact the officials at SHUATS. Below is the contact details. When will the application form to SHIATS Exam be available online? The online Application Form is already available. JEE MAIN already started giving the Application form from the month of December 2016. The prospectus and application form for SHIATS Exam will be available to all aspiring candidates from the first week of January.